[Untitled photograph of the Egyptian Revolution in Tahrir Square]. Retrieved May 2012 from: http://www.aljazeera.com/mritems/Images/2011/2/1/201121181825754633_20.jpg. [Untitled photograph of Egyptian flag]. Retrieved May 2012 from: http://www.mysticsaint.info/2011/02/egyptian-revolution-and-web-20-as.html. [Untitled image of word art]. Retrieved May 2012 from: http://fadfadation.blogspot.com/2012/01/part-23-reflections-on-outstanding.html. [Untitled photograph of child holding Egyptian flag]. Retrieved May 2012 from: http://www.yemenfox.net/articles.php?lng=english&print=126. [Untitled photograph of Mubarak portrait]. Retrieved May 2012 from: http://www.nytimes.com/interactive/world/middleeast/2011-spreading-revolutions.html#9. [Untitled cartoon of Khaled Said and Mubarak]. Retrieved May 2012 from: http://marxist-theory-of-art.blogspot.com/2011/02/latuff-on-revolution-in-egypt.html. [Untitled photograph of Who’s Afraid of Twitter sign]. Retrieved May 2012 from: http://cronkitehhh.personal.asu.edu/2012/02/namibia-and-the-egyptian-revolution/twitter-egypt-revolution/. [Untitled screenshot of Twitter]. Retrieved May 2012 from: http://emajmagazine.com/2011/09/13/egypts-revolution-media-a-question-of-credibility/. [Untitled screenshot of Twitter]. Retrieved May 2012 from: http://engmis.wikidot.com/egypts-revolution-by-social-media. Fairy, Shepard (Artist). (2011). The Protestor [photograph]. Retrieved May 2012 from: http://www.highsnobiety.com/news/2011/12/14/shepard-fairy-time-magazine-person-of-the-year-cover/. [Untitled photograph of female protesters]. Retrieved May 2012 from: http://www.lossofprivacy.com/index.php/2011/01/the-women-of-the-egyptian-revolution/. [Untitled photograph of elderly Egyptian man with a sign]. Retrieved from May 2012 from: http://www.jadaliyya.com/pages/index/703/egypt_a-multi-generational-revolt. Gazeer (artist). Tank Versus Bread Biker and Sad Panda (graffiti). Retrieved May 2012 from: http://blog.art21.org/2012/04/24/revolution-2-12-this-years-arab-spring-as-told-by-its-art-and-music-part-i/. What’s Going on in Egypt? The Huffington Post, last modified January 28 2011, http://www.huffingtonpost.com/2011/01/28/whats-going-on-in-egypt_n_815734.html. Tunisia Profile. BBC News, last modified December 12 2011, http://www.bbc.co.uk/news/world-africa-14107241. Tunisia. The New York Times, last modified April 9 2012, http://topics.nytimes.com/top/news/international/countriesandterritories/tunisia/index.html. [Slideshow photograph 1]. Retrieved April 2012 from: http://spikethedragon.wordpress.com/2012/04/03/arab-spring/. [Slideshow photograph 2]. Retrieved April 2012 from: http://www.infoplease.com/atlas/country/tunisia.html. [Slideshow photograph 3]. Retrieved April 2012 from: http://images.smh.com.au/2011/03/05/2217023/article-bouazizi1-420×0.jpg. [Slideshow photograph 4]. Retrieved April 2012 from: http://www.nytimes.com/interactive/world/middleeast/2011-spreading-revolutions.html#4. [Slideshow photograph 5]. Retrieved April 2012 from: http://www.nytimes.com/interactive/world/middleeast/2011-spreading-revolutions.html#7. [Slideshow photograph 6]. Retrieved April 2012 from: http://www.nytimes.com/interactive/world/middleeast/2011-spreading-revolutions.html#9. [Slideshow photograph 7]. Retrieved April 2012 from: http://www.nytimes.com/interactive/world/middleeast/2011-spreading-revolutions.html#11. Hosini Mubarak [photograph]. (2011). Retrieved March 2012 from: http://sflchronicle.com/news/2011/06/hosni-mubarak-has-cancer-or-does-he/. [Untitled photograph of Mohamed ElBaradei]. Retrieved March 2012 from: http://www.globalresearch.ca/index.php?context=va&aid=18750. Abramovich, Eitan (photographer). (2011). [Untitled photograph of Omar Suleiman]. Retrieved March 2012 from: http://www.guardian.co.uk/media/2011/feb/06/wikileaks-egypt-omar-suleiman-muslim-brotherhood. [Untitled photograph of Muslim Brotherhood symbol]. Retrieved March 2012 from: http://en.wikipedia.org/wiki/Muslim_Brotherhood. Fairy, Shepard (Artist). (2011). The Protestor [photograph]. Retrieved March 2012 from: http://www.highsnobiety.com/news/2011/12/14/shepard-fairy-time-magazine-person-of-the-year-cover/. “Egypt protesters clash with police,” Aljazeera.com, last modified January 25 2011, http://www.aljazeera.com/news/middleeast/2011/01/201112511362207742.html. “Fresh anti-govt protests in Egypt,” Aljazeera.com, last modified January 26 2011, http://www.aljazeera.com/news/middleeast/2011/01/201112663450547321.html. “Egypt gears up for gigantic protest,” Aljazeera.com, last modified February 1 2011, http://www.aljazeera.com/news/middleeast/2011/01/20111311965695371.html. Walter Ambrust, “Tahrir: Shock and awe Mubarak style,” Aljazeera.com, last modified February 3 2011, http://www.aljazeera.com/indepth/opinion/2011/02/20112310224495606.html. Gregg Carlstrom, “Community amid Egypt’s chaos,” Aljazeera.com, last modified February 7 2011, http://www.aljazeera.com/news/middleeast/2011/02/201127162644461244.html. “Mass protests continue in Egypt,” Aljazeera.com, last modified February 8 2011, http://www.aljazeera.com/news/middleeast/2011/02/20112851424979539.html. “Egypt protests remain strong,” Aljazeera.com, last modified February 9 2011, http://www.aljazeera.com/news/middleeast/2011/02/20112941258340509.html. Mohammed Haddad, “Egypt: Relive the revolution,” Aljazeera.com, last modified February 1 2012, http://www.aljazeera.com/indepth/features/2011/03/2011368587809435.html. “Al Jazeera,” Wikipedia.org, accessed April 9 2012, http://en.wikipedia.org/wiki/Al_jazeera. Cooper, Helen and Mark Landler. “White House and Egypt Discuss Plans for Mubarak’s Exit”. The New York Times. 3 February 2011. http://www.nytimes.com/2011/02/04/world/middleeast/04diplomacy.html?pagewanted=all&gwh=F1180D9FDFDA84902C0B58A2830BA4E2. Fahim, Kareem. 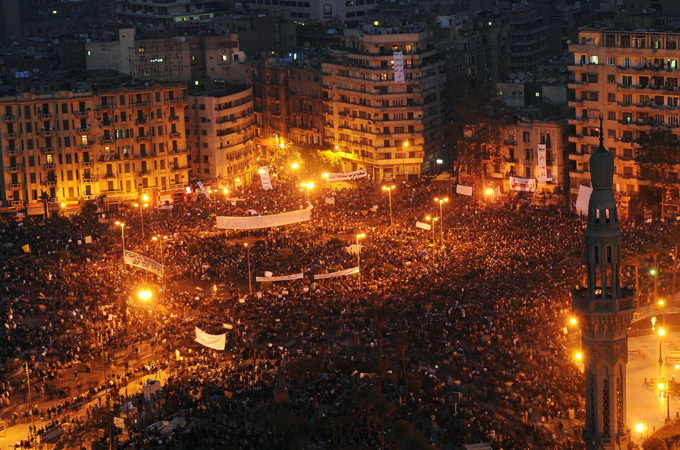 “Egypt’s Tahrir Square Again Echoes With Cries for Justice”. The New York Times. 8 February 2011. http://www.nytimes.com/2011/07/09/world/middleeast/09egypt.html?gwh=0D9FAB1A201BAC5C36D2916A3476AFE0. Fleishman, Jeffrey and Amaro Hassan. “Mubarak Promises Reform, But Defends Crackdown on Protesters”. The Los Angeles Times. 28 January 2011. http://articles.latimes.com/2011/jan/28/world/la-fg-0129-egypt-protests-20110129. Knowlton, Brian. “Clinton Urges Egyptian Dialogue”. The New York Times. 30 January 2011. http://www.nytimes.com/2011/01/31/world/middleeast/31clinton.html?gwh=F2262FEE3C06A19B35B80974E3407BC3. Kirkpatrcik, David. “Egyptians Defiant as Military Does Little to Squash Protests”. The New York Times. 29 January 2011. http://www.nytimes.com/2011/01/30/world/middleeast/30-egypt.html?pagewanted=all. Kirkpatrick, David. “Mubarak’s Grip on Power is Shaken”. The New York Times. 31 January 2011. http://www.nytimes.com/2011/02/01/world/middleeast/01egypt.html?pagewanted=all. Kirkpatrick, David. “As Egypt Protest Swells, U.S. Sends Specific Demands”. The New York Times. 8 February 2011. http://www.nytimes.com/2011/02/09/world/middleeast/09egypt.html?pagewanted=all. Kirkpatrick, David. “Mubarak Orders Crackdown, With Revolt Sweeping Egypt”. The New York Times. 28 January 2011. http://www.nytimes.com/2011/01/29/world/middleeast/29unrest.html?pagewanted=all. Kirkpatrick, David. “Mubarak’s Allies and Foes Clash in Egypt”. The New York Times. 2 February 2011. http://www.nytimes.com/2011/02/03/world/middleeast/03egypt.html?pagewanted=all&gwh=A94390E1AE6B9DA56CBC1FCA96925E32. Kirkpatrick, David. “Egypt Erupts in Jubilation As Mubarak Steps Down”. The New York Times. 11 February 2011. http://www.nytimes.com/2011/02/12/world/middleeast/12egypt.html?pagewanted=all&gwh=006492FD02D0ACA05B8CB0B10B613EFF. Kirkpatrick, David. “Wired and Shrewd, Young Egyptians Guide Revolt”. The New York Times. 9 February 2011. http://www.nytimes.com/2011/02/10/world/middleeast/10youth.html?pagewanted=all&gwh=CD280BFDECAAB4D41A57770690FD674F. Kirkpatrick, David and Michael Slackman. “Egypt Youths Drive the Revolt Against Mubarak”. The New York Times. 26 January 2011. http://www.nytimes.com/2011/01/27/world/middleeast/27opposition.html?pagewanted=all&gwh=D65228DEFF33C0178AE3B91795989F8F. Mackey, Robert. “Updates on Day 18 of Egyptian Protests”. The New York Times. 11 February 2011. http://thelede.blogs.nytimes.com/2011/02/11/latest-updates-on-day-18-of-egypt-protests/. Richter, Paul and Jeffrey Fleishman. “Egypt Security Forces Crackdown on Scattered Protests”. The Los Angeles Times. 27 January 2011. http://www.latimes.com/news/nationworld/world/la-fg-egypt-protests-20110127,0,6166307.story. Shadid, Anthony. “Egyptians Wonder What’s Next”. The New York Times. 29 January 2011. http://www.nytimes.com/2011/01/30/world/middleeast/30voices.html?pagewanted=all&gwh=F784A8D23E7D9D8B7E1FB68D8FB4A353. Shane, Scott and David Kirkpatrick. “Military Caught Between Protesters and Mubarak”. The New York Times. 10 February 2011. http://www.nytimes.com/2011/02/11/world/middleeast/11military.html?gwh=C0C83D031D30C78E63A22DE4DBB2DDE5. Stack, Liam. “Egyptian Military Cracks Down on New Protests”. The New York Times. 25 January 2011. http://www.nytimes.com/2011/02/26/world/middleeast/26egypt.html. Preston, Jennifer. “Movement Began With Outrage and a Facebook Page That Gave It an Outlet”. The New York Times. 5 Feburaury 2011. http://www.latimes.com/news/nationworld/world/la-fg-egypt-protests-20110127,0,6166307.story. Cohen, Richard. “A Democratic Egypt of a State of Hate?” The Washington Post, 12 Feburary 2012. http://www.washingtonpost.com/wp-dyn/content/article/2011/01/31/AR2011013105710.html. DeYoung, Karen. “U.S. Seeks Swift Transition in Egypt”. The Washington Post, 12 Feburary 2012. http://www.washingtonpost.com/wp-dyn/content/article/2011/01/30/AR2011013004683.html. Diehl, Jackson. “Obama Administration Ignored Clear Warnings on Egypt”. The Washington Post, 12 Feburary 2012. http://www.washingtonpost.com/wp-dyn/content/article/2011/02/08/AR2011020805786.html. Dunne, Michele. “After Mubarak, What’s Next for Egypt?”. The Washington Post, 12 Feburary 2012. http://www.washingtonpost.com/wp-dyn/content/article/2011/02/04/AR2011020406581.html. Kornblut, Anne E. “In Back Change in Egypt, U.S. Neoconservatives Split with Israeli Allies”. The Washington Post, 12 Feburary 2012. http://www.washingtonpost.com/wp-dyn/content/article/2011/02/02/AR2011020206144.html. Londono, Ernesto. “Muslim Brotherhood Eyes Comeback in Egypt”. The Washington Post, 12 Feburary 2012. http://www.washingtonpost.com/wp-dyn/content/article/2011/02/07/AR2011020706037.html. Schneider, Howard and Greg Jaffe. “A Test of Egypt’s Military and Its Relations with U.S”. The Washington Post, 12 Feburary 2012. http://www.washingtonpost.com/wp-dyn/content/article/2011/01/29/AR2011012904546.html. Whitlock, Craig. “U.S. reexamining relationship with Muslim opposition group”. The Washington Post, 12 February 2012. http://www.washingtonpost.com/wp-dyn/content/article/2011/02/02/AR2011020206550.html. Zacharia, Janine. “Israel Ponders Border Security, Enlarged Military Amid Egypt Unrest”. The Washington Post, 12 Feburary 2012. http://www.washingtonpost.com/national/for-israel-change-could-upend-long-held-security-assumptions/2011/02/03/ABFJO5E_story.html. Lake, Eli. “Muslim Brotherhood seeks end to Israel treaty”. The Washington Times. 14 February 2012. http://www.washingtontimes.com/news/2011/feb/3/muslim-brotherhood-seeks-end-to-israel-treaty/?page=all. Murdock, Heather. “Egyptians Show No Signs of Weariness”. The Washington Times. 13 February 2012. http://www.washingtontimes.com/news/2011/feb/8/egyptians-show-no-signs-of-weariness/?page=all. Scarborough, Rowan. “Key Military, Intelligence Assets Imperiled in Egypt”. The Washington Times. 13 February 2012. http://www.washingtontimes.com/news/2011/jan/31/key-military-intelligence-assets-imperiled-egypt/?page=all. Sen, Ashish Kumar. “U.S. Supports Egyptians’ Right to Demonstrate”. The Washington Times. 13 February 2012. http://www.washingtontimes.com/news/2011/jan/26/us-supports-egyptians-right-to-demonstrate/. Sen, Ashish Kumar. “Egyptian Muslims Call Out for ElBaradei”. The Washington Times. 13 February 2012. http://www.washingtontimes.com/news/2011/jan/30/egyptian-muslims-call-out-for-elbaradei/?page=all. Waterman, Shaun. “Mubarak’s Ouster Puts U.S. in Bind”. The Washington Times. 13 February 2012. http://www.washingtontimes.com/news/2011/feb/3/mubaraks-ouster-puts-us-in-bind/?page=all. The Washington Times. “What’s Next in Egpyt?”. The Washington Times. 13 February 2012. http://www.washingtontimes.com/news/2011/feb/10/whats-next-in-egypt/. “Bothaina Kamel”. Egypt Today. 1 June 2011. ET Staff. “January 2011”. Egypt Today. El-Kersh, Assem. “What has Really Changed?,” Al-Ahram Weekly. 16 February 2011. Rasekh, Ingy. “Testimony from Tahrir,” Al-Ahram Weekly. 16 February 2011. Charbel, Jano. “Arrested: Al-Masry Al-Youm’s Day of Anger Reporter’s Diary,” Egypt Independent. Adly, Amr. “Is the Egyptian Economy on the Brink of Collapse?.” Egypt Independent. 22 May 2011. Getty Images [Untitled photograph of Egyptian protesters]. Retrieved April 2012 from: http://www.forbes.com/sites/ilanberman/2011/02/11/after-mubarak-the-deluge/. [Untitled image of the American and Egyptian flags]. Retrieved May 2012 from: http://www.enduringamerica.com/storage/blog-post-images/EGYPT%20US%20FLAGS.jpg?__SQUARESPACE_CACHEVERSION=1325756371044. [Untitled image of Obama and Mubarak]. Retrieved May 2012 from: http://ionenewsone.files.wordpress.com/2011/02/090818_obama_mubarak_600_1.jpg. [Untitled image of US aid to Egypt]. Retrieved May 2012 from: http://news.bbcimg.co.uk/media/images/51108000/gif/_51108641_us_aid_egypt_464gr.gif. [Untitled image of Obama and the presidents of Israel and Palestine]. Retrieved May 2012 from: http://www.rfi.fr/actuen/images/117/obama_abbas_netanyahu_432.jpg. Mohamed Abd El-Ghant (photographer). (2011). Supporters of Egypt’s Muslim Brotherhood (photograph). Retrieved May 2012 from: http://blogs.reuters.com/faithworld/2011/12/01/egypts-muslim-brotherhood-feels-its-time-has-come/. Winegar, Jessica 2006. Creative Reckonings: The Politics of Art and Culture in Contemporary Egypt. California, Stanford University Press. Saad, Reem. “War in the Social Memory of Egyptian Peasants.” In War, Institutions, and Social Change in the Middle East. Heydemann, Steven. Berkley, University of California Press: 240-257. “Reem Saad,” American University in Cairo, accessed April 9, 2012 from: http://www.aucegypt.edu/fac/Profiles/Pages/ReemSaad.aspx. Who is She in Egypt? Retrieved April 9, 2012 from: http://whoisshe.wmf.org.eg/expert-profile/reem-saad. “Jessica Winegar,” Northwestern University, accessed April 9 2012, http://www.anthropology.northwestern.edu/faculty/winegar.html. Jessica Winegar, “The privilege of revolution: Gender, class, space and affect in Egypt,” American Ethnologist, Vol 39, No. 1 (2012), pp. 67-70, http://www.anthropology.northwestern.edu/faculty/documents/WinegarPrivilegeofRevolution.pdf. Jessica Winegar Membership Lecture: Creativity and Revolution: Egypt at a Crossroads, October 6, 2011 [Photograph]. Retrieved April 2012 from: http://sarweb.org/index.php?membership_lecture_jessica_winegar. Jessica Winegar, “Egypt: A Multi-Generational Revolt” Jadaliyya, last modified February 21 2011, http://www.jadaliyya.com/pages/index/703/egypt_a-multi-generational-revolt.